Simblissity: Tailor Made Whiteboards - a review and GIVEAWAY! Thankfully, in February, Tailor Made Whiteboards offered to share a customizable whiteboard with me and another for one of my readers! I designed mine to use as a wall calendar and held my breath, hoping it would be perfect enough to replace our yearly hunts for perfect calendars. It is. It's beautiful. It has fabulous large squares to hold all the details we want to add. The quality is incredible and it is obvious that it is sturdy enough to last for as long as we're going to need a calendar, which means a very. long. time. Let me tell you briefly about the whiteboards in general and then I'll share mine with you. After that, the giveaway! Tailor Made Whiteboards aren't just for calendars. They can be designed as Menu Planners, Chore Charts, or anything you want them to be. Tailor Made offers many one-of-a-kind designs created with the help of a local Colorado artist, and all of the designs can be personalized because they make them in-house and are eager to work with customers. The whiteboards come with a Quick Change frame that lets you easily change the graphic insert so that function of the whiteboard can always fit your needs. When mine were younger, a chore chart would have been handy. The calendar is definitely what we need at this stage of life, but when the busy teenage schedules are gone, the menu planner will suit us best. There are many designs to choose from, but they will even work with you to custom design your own background insert. If I had the budget, I would buy different inserts just for the seasonal themes. There are beautiful Christmas calendars and spring calendars and...well, you get the picture. The point is that these things are going to last. I have no doubt the whiteboard and frame will last us well beyond the teen years of parenting. All of the products are guaranteed to wipe clean and remain stain-free over many years of use. I chose the Chalkboard Activity Planner in an 18x24 size. 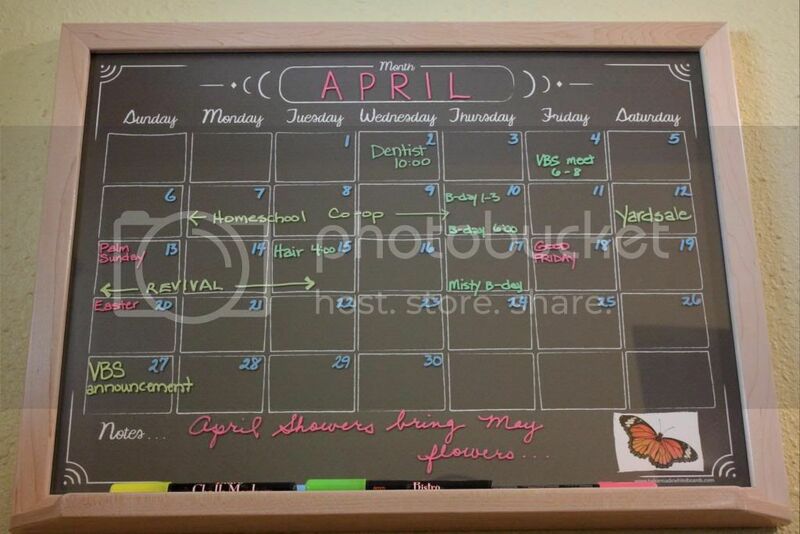 I chose a black chalkboard background and went with the Maple Changeable Frame. The wood is light, but is well-sealed and I have no worries about it staining or getting dingy. I love the 24 inch tray, which is plenty deep to hold erasers and markers with ease. You can personalize your board with an image that you upload. A family photo is a popular option, but I decided to add a scrappy butterfly instead.The butterfly is a symbol of Hope and this simple picture reminds me of the freedom and hope I have in Christ and the new life He has given me. The full price for the whiteboard I received, with all of the customizations and accessories would have been just over $100. My penny-pinching brain seized up at the thought, but then I realized that I have spent well over that amount on calendars over the last few years. The frame for my old calendar cost $30 originally and the calendars that fit it cost us $15-18 each year. They are beautiful and we considered them part of our home decor as well as an investment in our sanity. This whiteboard is of significantly higher quality than our old frame and will be around for many, many more years. This sturdy tool can be handed down to grandkids someday! Now for the giveaway! Before entering, please note that this contest is open to U.S. and Canadian addresses only. Canadian addresses will be charged a $45 fee to offset the cost of international shipping.